WILMINGTON – The time it takes to get a permit in coastal North Carolina for one type of living shoreline just got a whole lot faster and less expensive. The North Carolina Division of Coastal Management earlier this week announced its release of an amended general permit for marsh sills. The state permit mirrors the U.S. Army Corps of Engineer’s new general regional permit that rolled out March 22, streamlining a process that, on average, spanned an average of two and a half months. “They’ll basically get their permit on site if they meet the conditions,” said Henry Wicker, the Corps’ deputy chief for the regulatory division at its Wilmington district office. This puts the permitting process for marsh sills on par with how long it typically takes an applicant to receive a permit for hardened shoreline erosion control structures like bulkheads and riprap, or stone revetments. Marsh sills are a type of living shoreline that are made of wood or rock designed to protect existing or newly planted wetland vegetation by dissipating wave energy and reducing shore erosion. The general regional permit does not allow fill to be placed landward of a marsh sill. Ronnie Smith, special projects manager of the Corps’ Wilmington Regulatory Field Office, said work began on a general regional permit for marsh sills about two years ago. Several state and federal agencies – DCM, North Carolina Division of Marine Fisheries, National Oceanic and Atmospheric Administration, U.S. Fish & Wildlife Service and National Marine Fisheries Service – collaborated to create the permit’s conditions. Wicker said the Corps had worked closely with those agencies as well as the North Carolina Coastal Federation and other environmental groups to create a “non-reporting” permit, meaning the Corps does not have to inspect a site as long as the state deems the permit conditions have been met. Living shoreline proponents have long sought changes in what they say has been a permitting process that was a deterrent to natural shoreline erosion control. 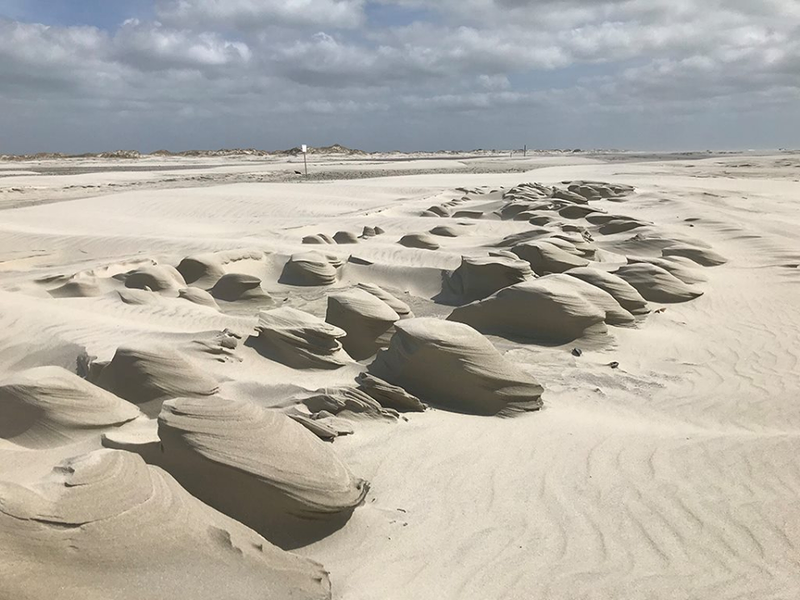 “I don’t think you can underestimate the disincentive from before,” said Tracy Skrabal, a coastal scientist and manager of the federation’s Southeast Regional Office in Wrightsville Beach. Until now, an applicant had to apply for a Coastal Area Management Act, or CAMA, major permit. Overall, that permitting process cost more – the application fee was typically $400 for marsh sills – and took an average of 75 days. Since the mid 2000s the state has granted CAMA major permits for about 80 marsh sills, according to Daniel Govoni, DCM policy analyst and federal consistency coordinator. 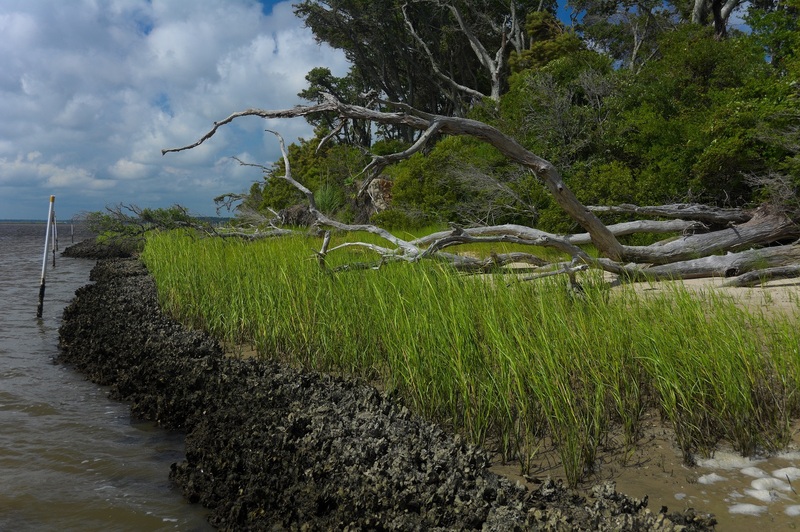 Talk of streamlining the permitting process for marsh sills spans back years as research increasingly shows that man-made shorelines that mimic nature are better for estuaries than rock or wooden seawalls and bulkheads. Living shorelines generally work best along sheltered coasts such as estuaries, bays, lagoons and coastal deltas, where wave energy is low to moderate. Marsh sills are proving to better withstand coastal storms than hardened structures. “Post Hurricane Florence all indications show marsh sills have been very resilient as opposed to bulkheads,” Govoni said. Hurricane Florence left a massive trail of destruction, damage and debris in its wake after making landfall near Wilmington in September 2018. The storm damaged the bulkhead lining the larger portion of John Stanback’s waterfront property on the Core Sound in Marshallberg, a small community in Carteret County. 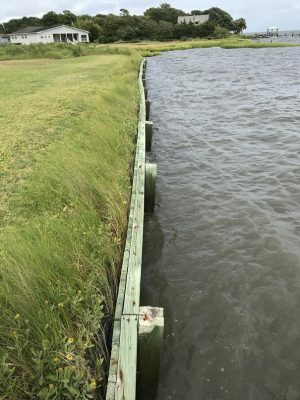 Stanback, who had learned about living shorelines from literature published by the federation, decided to replace the bulkhead with a marsh sill along the approximately 200-foot shoreline. “I think it’s a beautiful way to help restore oysters and a more natural way to protect the shore,” he said. The Stanbacks, whose primary residence is in Chapel Hill, hired forestry and natural resources contracting firm Carolina Silvics to do the work. The couple were advised to put off the work until the marsh sill permits’ release. “We were thrilled to hear about that,” Stanback said, referring to how the permitting process would be much quicker. Their project is to be constructed with bagged oyster shells. Grainger Coughtrey, a forestry technician with Carolina Silvics, said he expects more work from the construction of living shorelines. And with a $200 fee, it’s half the cost of what a CAMA major permit fee typically was for marsh sill projects. Despite mounting evidence that living shorelines are highly effective in protecting waterfront property and better for the environment, hardened structures continue to be the primary go-to for shoreline erosion control. NOAA estimates that nearly a third of the nation’s contiguous estuarine shoreline will be hardened by 2100 if the structures continue to be built at the current rate and the coastal population continues to grow. A 2015 study published by a team of academic researchers estimates that more than 14,000 miles – 14% of continental U.S. coastline – has been armored with hardened structures. The study called that a conservative estimate. The hope is that the new permitting process will tip the scales where marsh sill projects are the norm rather than the exception. The state Coastal Resources Commission approved the amended general permit for marsh sills during its quarterly meeting in February. The permit became effective as a temporary rule April 1. 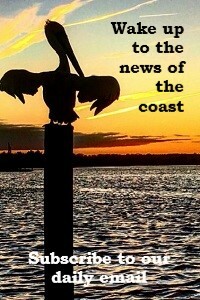 DCM officials will ask the CRC to permanently adopt the rule during the commission’s April 17-18 meeting in Manteo. Once adopted, the rule will go back to the state Rules Review Commission for final approval.